I just wanted to let you know that Geoff & I have set up both our new shop and a mailing list. We will be making the items in our shop available at 6 PM EST tonight, but please feel free to preview the items listed here. Please note that the totes are available in very limited quantities, and that at the moment, we have no neckties! I have to make those. But there are a handful of calendars and lots of photographic prints, if you're into those. We will have more totes (including a new design) available as soon as we can get a new screen together. If we sell out of calendars, we may print more, depending on demand. Please feel free to sign up for our mailing list here. I promise we won't send out too many emails. I have three more rolls of film from Portland to share soon, and I will reply to the comments on my last post the next time I post (oh the anticipation, am I right?). Thanks, everyone! True story: everyone who looked at Geoff's dreamcats-inspired calendar at Little Winter smiled. Well, that I saw. Very exciting! I love the banner of the shop! I may be interested in a tie for my guy - going to show them to him to see it he likes the shape. Did the Thunder in Our Hearts tote sell out already? Oh man! Congrats on the new store Anabela - it looks beautiful!! Oh a thousand tears to have missed the thunder in our hearts tote. I have consoled myself with a swan print instead. I missed it! Ahh! SOLDOUT. Beautiful calendar. I bought two of them. One for me of course and one for my best friend Dorothy who adores cats. Her cat's name is Gaynor. Whenever we spoke on the phone, she tells me the latest about Gaynor; how he claims his seat lately for example. I wished I was able to come to Portland to buy it in person but I am so happy to have been able to buy it online as it is absolutely gorgeous drawings. Have a good day! I am the person who bought the sweet little cat painting for my daughter. I love your stuff and it's so hard to wait to give it to her. Thank you again. Nice to meet you fellow Torontonian lomographer! 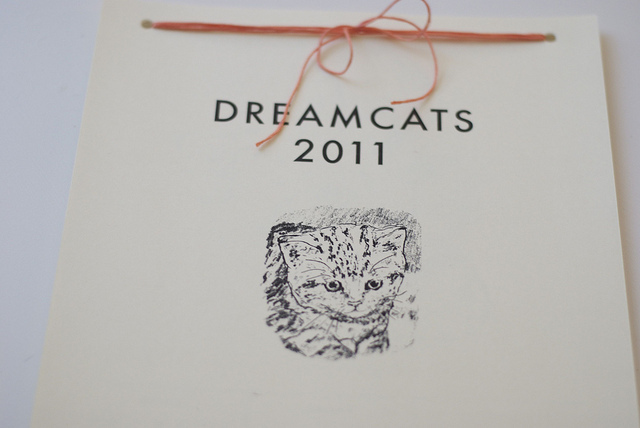 What a beautiful dream cat calendar!